The VersaPro is 5 Machines in One! 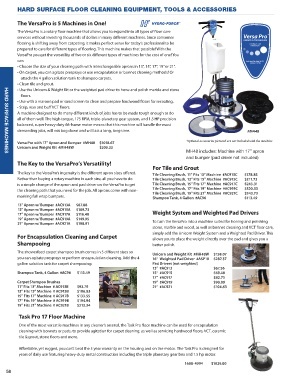 • Choose the size of your cleaning path with interchangeable aprons in 13”, 15”, 17”, 19” or 21”. attach the 4 gallon solution tank to shampoo carpets. • Clean tile and grout. • Use with a maroon pad or sand screen to clean and prepare hardwood floors for recoating. • Strip, wax and buff VCT floors. The Key to the VersaPro’s Versatility! tile & grout, stone floors and more. years of daily use featuring heavy-duty metal construction including the triple planetary gear box and 1.5 hp motor.